The Best Shoes for Early Walkers - it's BABY time! Many new parents often feel that finding the best shoes for early walkers might help their little ones get an early start on taking their first steps. Don’t be too quick to put on a shoe once they start getting up from all fours. The truth is the best thing for your baby when they start learning how to walk is to let them go barefoot! This allows them to establish their balance as going barefoot allows for more flexibility than a shoe. When it’s cooler, you can just put socks or stockings and let them go. Of course, you can’t let your little ones go shoeless everywhere. There are times when you’re out and about that shoes are required. With so many adorable baby shoes available it’s easy to just want to pick out the cutest pair; likewise, parents often feel they need to buy the cheapest shoes available because their child will quickly outgrow them. Keep in mind that not all shoes are created and equal and some offer very little to no support for a new walker. Here are some of the best shoes for early walkers that give your little one’s feet the support they need to encourage proper foot development. All of these brands mentioned are also recommended by the American Podiatric Medical Association. The ideal choice for your baby’s foot development, Robeez soft sole collection offer durable comfort with high quality leather. These shoes have an elasticized ankle design making them easy to slip on while staying on. They come in sporty sneaker-inspired designs and precious patterns for a sensible shoe with style. 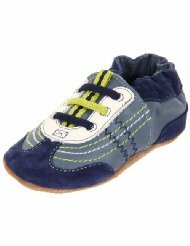 This brand offers comfortable and supportive shoes for your tot with a sense of fashion! They are made of super soft leather to provide flexibility while protecting their little feet whether indoors or out. The sole is made of slip-resistant rubber to offer a better grip and the velcro closure makes them easy to slip on and off. They are also very cute with fun styles to choose from originals Mary Janes to originals Jones for boys. These adorable soft sole shoes are perfect for little walkers with 100% genuine leather to support early walkers. The suede soles help to minimize slipping. They have an elastic ankle design that helps them stay securely on your little ones foot while still easy to slip on and slip off without laces. They have sweet designs for girls and boys. And did I mention they’re cute!? These shoes are specifically designed to help encourage the healthy development of your little one’s feet. See Kai Run not only provides comfortable, supportive shoes but they have many classy styles to choose from for boys and girls. As a mother of a little boy I know how hard finding cute shoes can be. These have a super flexible sole and butter-soft leather with breathable lining. Made with soft Eco-leather, Bobux Originals shoes are tested for safety for your baby and the environment in a cute shoe that encourages little walkers’ natural movements. The soft sole allows ample flexibility while offering slip-resistance. Best of all, if your curious tot decides they want to mouth it as anything else, these are completely safe. When it comes to little feet, it’s ideal to find a shoe that offers the best fit. These Umi fashion sneakers fit the bill by offering ample support and comfort even for little ones with chubby feet. They have a rugged rubber sole that provides traction to protect your little one’s tootsies with a stitched assymetric toe cap. These shoes offer little ones support without constricting movement of their feet using Sensory Response Technology™. It features soft, mesh lined interior that offers comfort with a rubber sole to provide traction. The rounded design makes it easier for little ones to walk by reducing the chances of stumbles and falls for a more natural feel. The Bambi design is cute for little girls or choose the Artie design for boys. These shoes offer the ideal footwear for infants and toddlers who are learning how to walk with a flexible sole that offers a more natural-feeling stride for those first steps. They also have a nice rubber sole with deep treads to give optimal traction for slip-resistance. They also have really cute styles and patterns for boys and girls. The best shoes for early walkers are ones that fit well. Be sure when choosing a shoe that it fits comfortably. It’s a good idea to visit a shoe store that can size your baby’s foot to ensure you get the proper size for the best fit.